Over the years, the consumption of materials for construction exceeded more than half of the total materials consumed in the Netherlands, and construction waste exceeded the volume of solid waste produced by households. Since the introduction of the "Ladder van Lansink" (in the 1970’s) and the further development of the European Waste Framework Directives followed by the Circular Economy concept, waste prevention has been considered a priority measure. Whereas the goals to improve waste management towards waste-to-resource and waste elimination evolved from guidelines to political action (throughout the EU), reuse of products remained a less implicit strategy. The reuse of building products is an ancient practice; nonetheless, limited information is available regarding the aspects involved in the existing process. 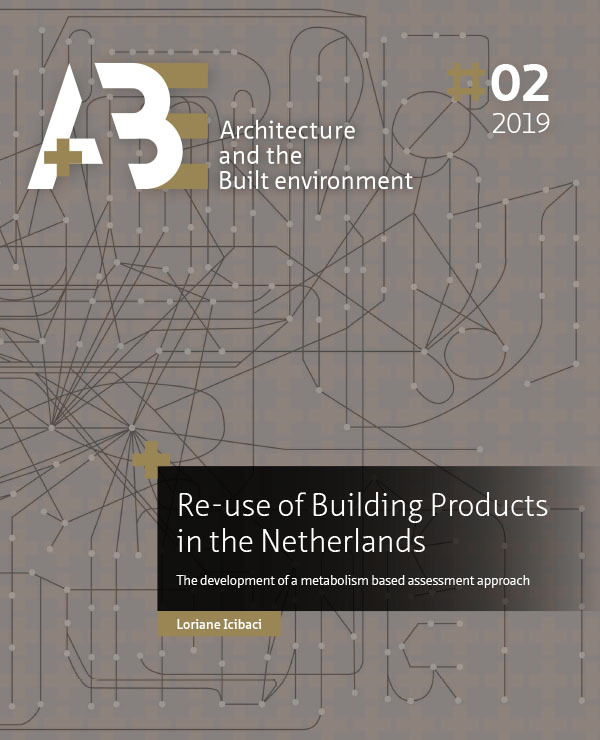 Reuse of building products has seen limited regulatory changes and remained a vague procedure within the resource efficiency discourse in the Netherlands. Building products remain in use for long time spans, which affects the planning and integration of strategies to recover them for reuse. When they are released from buildings (after renovation or demolition) and recovered, these products may not be compatible with new updated technical building requirements, or may not be competitive with upgraded, certified and cheaper new products. The weight, size, and practical challenges to deconstruct buildings are also factors affecting the harvest of such products. Besides these technical and economic aspects, used goods are susceptible to subjective evaluation regarding their "style" and used appearance. Contrary to different forms of waste treatment that transform used products into commodities; used products have intrinsic cultural, historical and aesthetic values influencing their economic value. To foster the integration of industrial activities to promote more efficient use of resources from the anthropogenic environment, it requires a better understanding of the constraints and opportunities among relations within a non-linear economy. This research departs from the desire to understand the practice of reuse of building products from a systemic standpoint, to illuminate its current condition and help to foresee future perspectives. The holistic approach in this research implies the investigation and representation of a network of multiple factors influencing the process of reusing in analogy to the nature of sustainability as a systemic concept that infers a holistic construction of different conceptual subsets. To perceive the continuity of the strategy of reuse, this research positions the object of study from an evolutionary perspective where relations condition the action of reuse. These relations are dynamic and contextually bounded defining the commercial feasibility of products to be reused rather than wasted. Understanding these relations enables to construct an analytical discourse that takes into consideration a multidisciplinary approach from which different strategies can be designed while contemplating their connectivity. What are the perspectives for reuse of building products from the housing stock, given contextual factors that influence the process chain and reserves? The Industrial Ecology concept provides a system’s perspective and the foundation of this study’s methodological framework to answer the main research question. It postulates that the internal relations of the industrial process, as well as relations that go beyond the industrial boundary, are sources of perturbations in the natural system, which is driven by human activities and motivate changes in material and substance flows by demand for services provided by products. Through this systemic perspective, to effectuate reuse of building products in the Netherlands, this research proposes to examine this practice as an industrial ecosystem. It describes the activities; actors and how different factors influence the process of building products' reuse. Reuse of products brings environmental benefits. This study does not evaluate which conditions and what are the environmental benefits of reuse. Nonetheless, the study acknowledges that not one-measure fits all, nor that reuse is the best measure in all contexts. The study departs from the premise established by existing guidelines in waste management and the CE (Circular Economy) concept that waste prevention including reuse should be prioritized. Assessing singular aspects of reuse can lead to limited or partial interpretations, risking future ineffective action plans or their complete absence. The practice of reuse is inferred in this study as a cluster of activities that co-exists with other clusters of activities (recycling industry, technological evolution of construction systems and product innovation, waste management, lifestyle, environmental education, policy, primary resources among others), and that changes occurred in each of these parts can also affect the performance of reuse. Single focus analyses are needed but complementary to the holistic approach to increment knowledge and verification of findings. The Industrial Ecology concept is used to emphasize the relevance to develop a systemic vision of reuse. The approach developed in this research exposes the connectivity between different factors and activities within the process and illuminates how these activities are performed. As result, different paths could be designed to improve the performance of the system. Description of the existent practices can help sharpen the understanding of the waste prevention of building products among scholars, practitioners, and policymakers. This research departs from the observation of the existing practice of reuse in the Netherlands to develop a tangible form of analysis and representation of the phenomena in the real world. The research contributes to the waste prevention and management debate, the possible conceptual vagueness, lack of detailing and transparency of what reuse consists, and how waste prevention is equivocally related to curbing economic growth. It also adds knowledge to the concerns of building a systemic approach for a CE exposed by previous scholars. The organizational, socio-economic and technological aspects of building products reuse. This segment examines internal relations of the industrial system of reuse, comprised by a description of the organization of activities and actors involved that characterize the supply chain and the practice of commercial reuse of building products in the Netherlands. The relations that go beyond the industrial boundary are clustered by the social, cultural economic, and technological factors influencing how building products are harvested from the building stock for consumption. The evolution of the housing stock as dynamic reserves (supply of reusable products). The industry of reuse, by analogy, relies on the evolution of the building stock to supply the consumption of reusable building products. To exam this relation, the study investigates what products are commercially reusable (present). These products are a reference to the examination of the housing stock evolution (reserves), which affects the supply of reusable products in speed, composition, and amount of products released from the stock. Finally, the research methodology delimits the industrial ecology of reuse as the sum of different relations influencing the flows of products harvested for commercial transactions of used building products. The representation of this network of relations reveals vulnerabilities and potentials in the industrial system to support future effectuation and evaluations for practice and policy. The conceptual model proposed is a map, a tool to assist the formulations of plans and tests in the learning curve to systematically implement waste prevention measures in the Netherlands. The following limitations guided the mixed methodology proposed in this study: Scarce information about the practice of building product reuse in the Netherlands including social demand for used products; the availability of hard numeric information in waste prevention and periodic consumption of building products for housing construction; the metabolism of the building stock in the Netherlands including information about the survivability and obsolescence of houses as well as periodic physical description of housing the stock at the product level and building sizes. The practice of reuse currently functions as an appendix of the demolition industry, bringing benefits as well as disadvantages. Among the benefits is a lean and integrated management of activities able to absorb time, administrative and economic hurdles. Some of the disadvantages are the limited formalization and specialization of activities as product development (treatment of used products), quality control and marketing, as well as lack of formal representation affecting public recognition and political support. In the economic context, direct costs involved in the process of reusing including transportation, storage, and workforce to deconstruct (associated with technology), as well as costs associated with processes to recondition used products for retail are critical parts of the economic equation. External factors influencing the economic benefits of reuse are for instance related to developments in waste management, tipping fees, fines of mixed materials and, prices of virgin materials and new products. The economic performance of reuse is also affected by investments and other forms of stimuli focused on developments in waste treatment or by policy regulating waste disposal and resource recovery. The social component is not only critical but has also been the least understood within the reuse process. Potential users and “waste” owners fundamentally lack knowledge on how to reuse, information about used products, where to find them and what are the benefits of reusing. Lack of certifications, warranties, standardization of products are also factors affecting the demand for used products. Additionally, the demand for used products concerns the interaction with potential consumers as the shopping experience, the image of the used product determining the “value” of the product and of reusing. Value is liable to change according to how the consumer perception arises about used products, about the action and experience to reuse and the economic benefits. The absence of quality control of used products to be applied in new constructions can pose risks to the performance of new buildings. In this context, integrating cascading reuse indicated to be a beneficial strategy complementary to reuse. Although the challenges to develop methods to efficiently process (remanufacture, resize, recondition) used components into new products while securing quality standards, safety requirements and economic viability exist; cascading reuse can help to overcome barriers related to public perception and consumption of used products. Lastly, the dynamic character of how the socioeconomic and technological relations identified above occur in the real world has to be taken into account to comprehend the status of building product reuse and to foresee future adaptation. Although improvements can be made in each one of these relations, it is relevant to understand how they can affect the system combined. For instance, increase building disassembly does not guarantee increase demand for used products in the future. Whereas the first part of the study revealed that a combination of factors defines what is commercially reusable in the Netherlands, the second part research analyses the capacity of product reuse in an existent context as a reference to estimate or plan strategies for future continuity. The juxtaposition between the operability of the industry of reuse and the evolution of the building stock represents the organization of a “typical” supply chain of reuse in the Netherlands. Regarding housing survivability, the housing stock in the Netherlands evolved to be characterized by single-family private houses, apparently larger, built under non-traditional methods and better sound constructed compared to the recent post-war period. These characteristics indicated to influence (increase) housing survivability. Especially in the West, where most activities in the national housing stock are concentrated, the increase of private single-family houses influences overall housing survivability in the Netherlands (particularly when the pre-1946 group gradually decreases). Regarding amounts of materials released accumulating in the housing stock, consumption of building materials per capita as well as continued housing stock increase were observed. As the population of single households expands, it is uncertain that house sizes will continue to rise as well. Nonetheless, despite the growth of material stock, the amount of material output can be offset by the increase housing survivability. Regarding types of materials, the study of frequent house typologies, as well as the analysis of material consumption trends, indicates stronger dissipation of stony based products, and in particular concrete and plastic based, in comparison to wood ceramics and metals. The decrease of traditionally built houses can influence decrease supply of used wood in the future, inflicting the industry of reuse to adapt to these changes. The analysis of trends in the housing stock and material consumption revealed how the supply of materials could affect reusing. The understanding of such trends at product scale resulted to be challenging through top- bottom approach and traditional material flow accounting. The study of the evolution of physical characterization of the housing stock from a bottom-up approach produced more consistent insight of housing stock trends at product level. Improving the classification system of the built housing stock according to physical characteristics including housing typologies, building age, description of building products (some of these characteristics are already being assessed to monitor energy efficiency) can facilitate monitoring of future material management. Strategies designed to improve waste prevention through reuse could be limited if they do not consider knowledge improvement of material reserves. The stock is getting larger but there should be delays in material output for reuse through withdraws due to the increase housing survivability. The accumulation of stony based products indicates future challenges to overcome as the technical and economic viability to reuse them and demand for this type of products; especially when considering the competition with technological advances aiming to improve recyclability of concrete. Finally, this holistic approach generates an overview of how dynamics in the housing stock and socioeconomic, and technological factors, associated direct and adjacent to the reuse process influence what is harvested for reuse in practice. The representation of these dynamic relations composes a conceptual model, which is the representation of the metabolism of building product reuse in the Netherlands. This “map” offers a way to improve the visualization and the understanding of how the trajectories of flows of products are reused as well as the motivations, conditions, and limitations behind them. It is a tool that facilitates future assessments on how to improve the recovery of products for reuse (illustrated by the case of wooden products); how to support decision making by practitioners and policymakers; how to detect the connectedness among different aspects of building product reuse. Ultimately it offers different paths to (re) generate additional evaluation or action with the aim to adapt the practice of reuse to changing conditions. The proposed conceptual model evolved from a composition of concepts adapted from the Industrial Ecology theoretical background to represent the system of the typical commercial practice of reuse of building products in the Netherlands, supplied by-products derived from the housing stock, and are centralized on the role of the practitioner. Accordingly, the data collection and most findings from the qualitative analysis departed from clustering information structured by the preconceived theoretical framework. Overall, the insight out of this research indicates that more work needs to be done in the direction to optimize existing relations associated with materials derived from building demolition activities in the Netherlands, to improve efficiencies through these relations foreseeing future integration with the evolution of waste management and circular resource management, and as well as diversify stakeholders unfolding in new collaboration, business models and new supply chains.